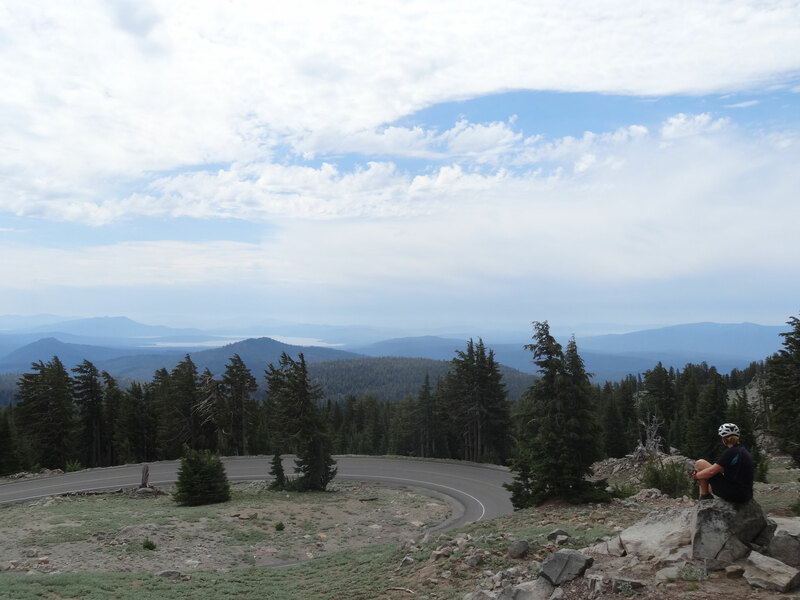 Arriving at Lassen Volcanic National Park, we were surprised that there were a lot less cars on the roads than in the National Parks we'd been to before. It's a relatively small park, but with a fascinating kind of out-of-the-world vulcanic landscape, complete with vulcanic stones, lava fields, bubbling and smoking mud-pools and scattered patches of remaining snow in the higher elevations. Throughout the next days, the landscape along the roadside was formed by cold lava. We even went on a short hike through a cave formed by cold lava, a „lava tube“. Riding in the near-dark one night after a long and hot day of cycling, we heard a loud commotion in the forest just next to the road – a bear maybe? We couldn't see a thing, but pedalled even faster and sang aloud in order to scare off (what we thought was) a bear – and probably all other wildlife in the near and far distance as well. We experienced our first rain since New Zealand the next day. The sky became darker and darker, the temperatures dropped quickly – and we almost managed not to get soaked and hit by hail the size of cherries before reaching our day's destinations. Almost. The following night we didn't have many sleeping options (a local lady recommended pitching our tent in front of the Walmart with „all the homeless“) and thus ended up camping on a rest area right off the highway, closed for restoration at the moment. Listening to trucks rushing past all night, we didn't sleep too well and didn't mind getting up at 3.30 am the next „morning“ to avoid the forecasted excessive heat. 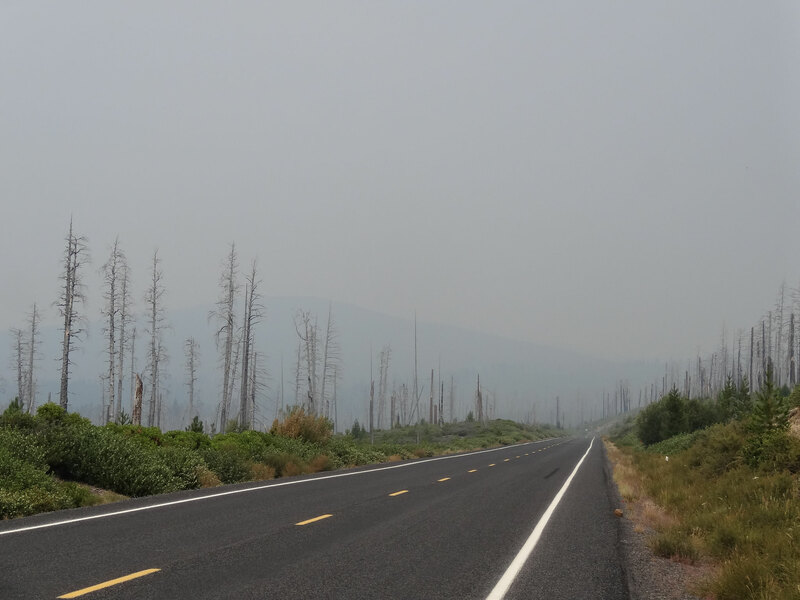 Continuing on towards Ashland, we rode through a lot of smoke and burned landscapes, since a huge wildfire had been burning there until just a few days earlier. After many weeks in California we finally crossed the Oregonian border, sharing the Interstate with many trucks and cars passing us. Arriving in Ashland, we were overwhelmed by the „city feel“ of the town. There were quite a lot of cultural events going on there (Ashland hosts the „Shakespeare festival“ each year, a 9-month long theater festival) and there were real restaurants and shops! It was almost a culture shock after a long time in small back-country villages, but we enjoyed watching theater shows and going to a bar again. During our days in town, there was an increasing amount of smoke in the air from a few wildfires around us. 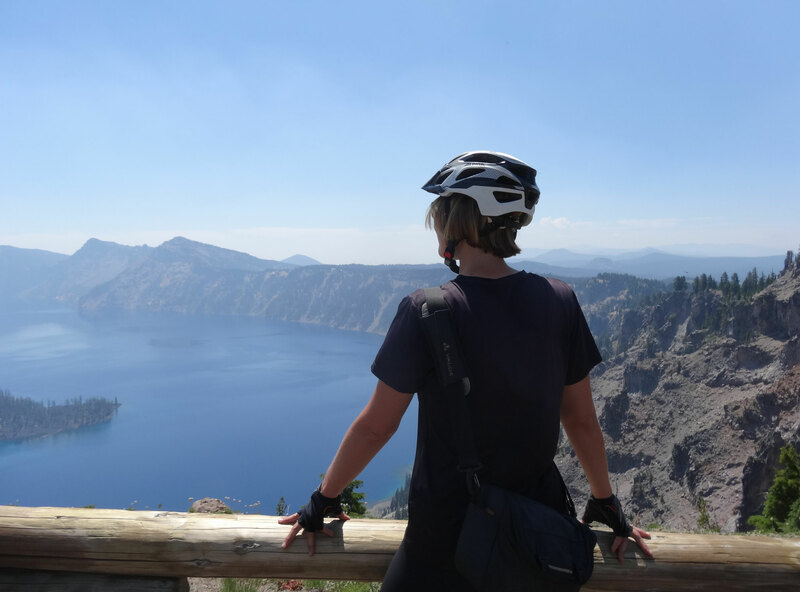 When we finally got going again, our great warmshowers host from Ashland drove us right out of the smokey valleys and into Crater Lake National Park, where it was getting a bit easier to breathe. Unfortunately, the air at the lake was still quite smokey, but the scenery was nonetheless impressive. Cycling down into the valley, there was another wildfire directly next to the road. As we approached it, the smoke and ashes made it harder to breathe, so we decided to try to hitchhike through the worst stretch. Fortunately, this time it worked, a firefighter on his day off felt sorry for us and took us in his truck to the next town. 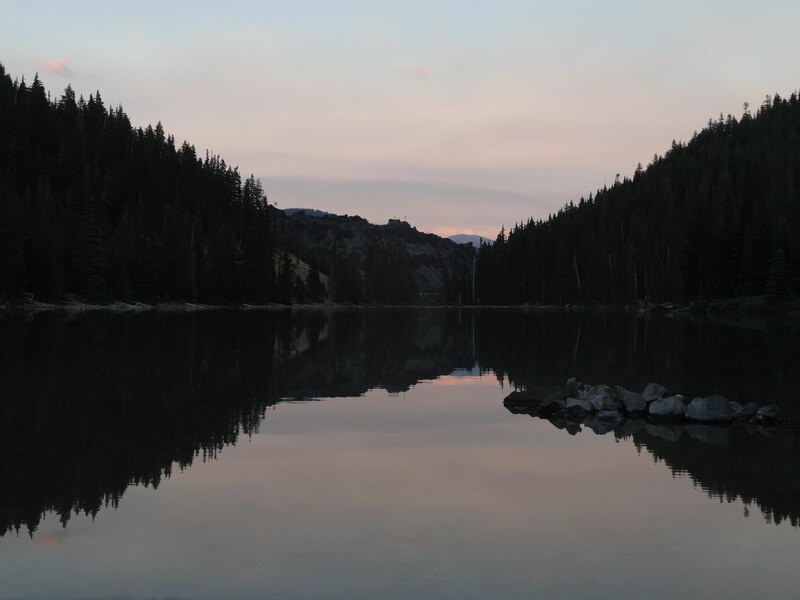 Only when we got a lot further up north on the Cascade Lakes highway did we leave the smoke behind. 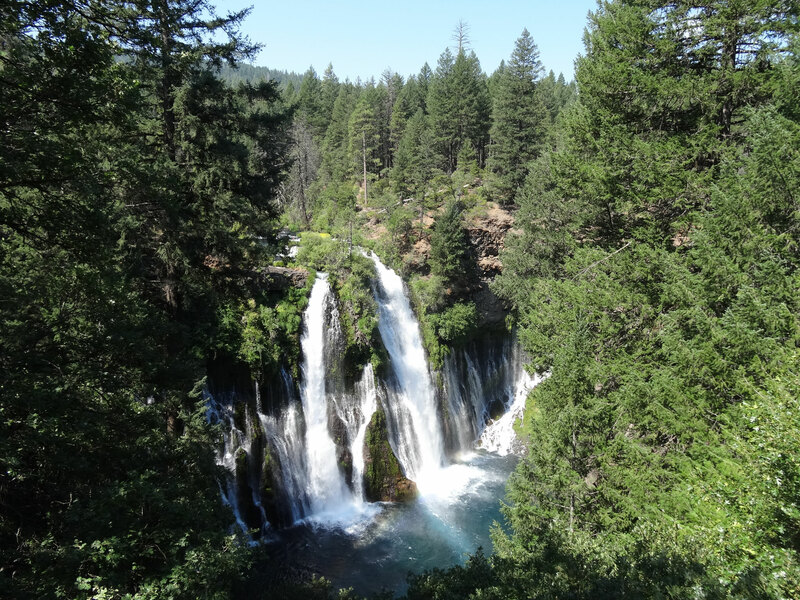 We thoroughly enjoyed cycling along the Cascade Lakes before heading into Bend, a nice little city, where we spent an afternoon strolling along a farmers' market and eating lots of tasty fresh berries. The next day again involved some climbing, and just before the summit someone stopped on the side of the road to offer us ice-cold watermelon! 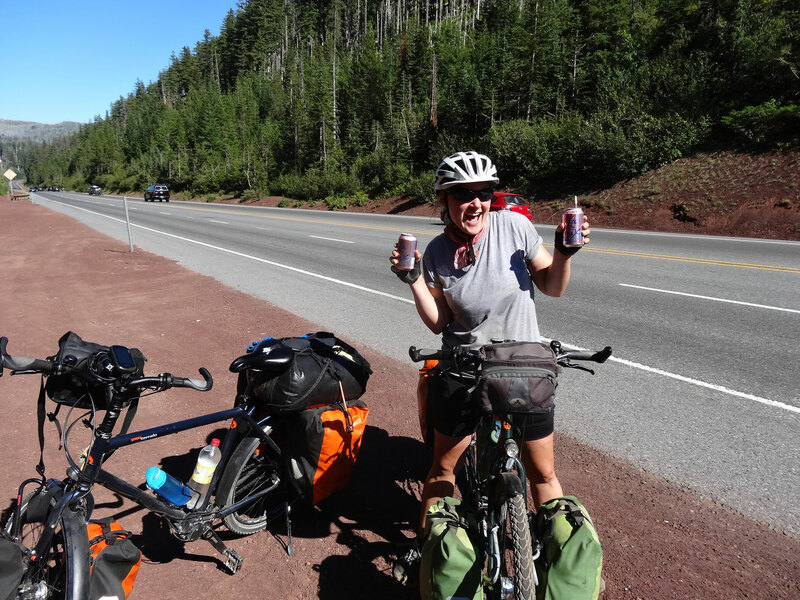 Actually, right after the summit, another car stopped along the road only to offer us two ice-cold soda waters! We felt like we'd won the lottery. There is so much more kindness in this world than we are often made to believe. Our next and long-awaited destination was Portland, Oregon. 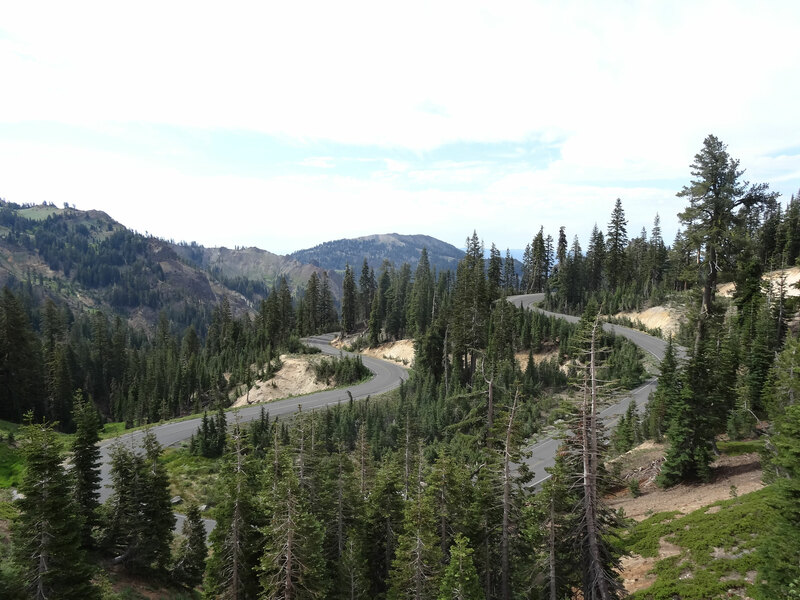 We took a beautiful forest road that led us along rivers almost all the way to Portland. 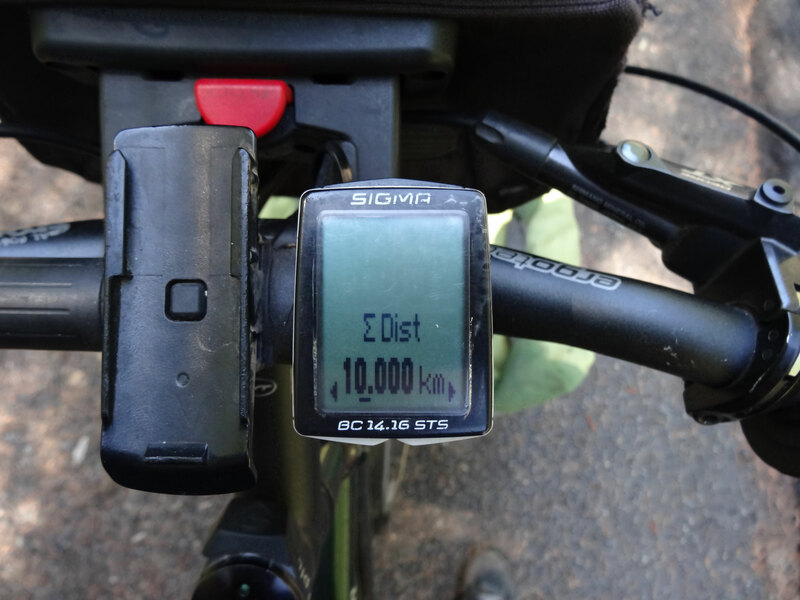 And it was on this nice stretch that we cycled our 10.000th kilometer on this journey, which we celebrated right on the spot with a sip of warm tap water left in our bottles and a few days later with a decent glass of wine. Initially, we had planned to only stay a few days in Portland, but we both enjoy being in a city again. We went to the movies for the first time in the past months, got a taste of Portland's famous food cart scene and went to an improv theater show our warmshowers host performed in. 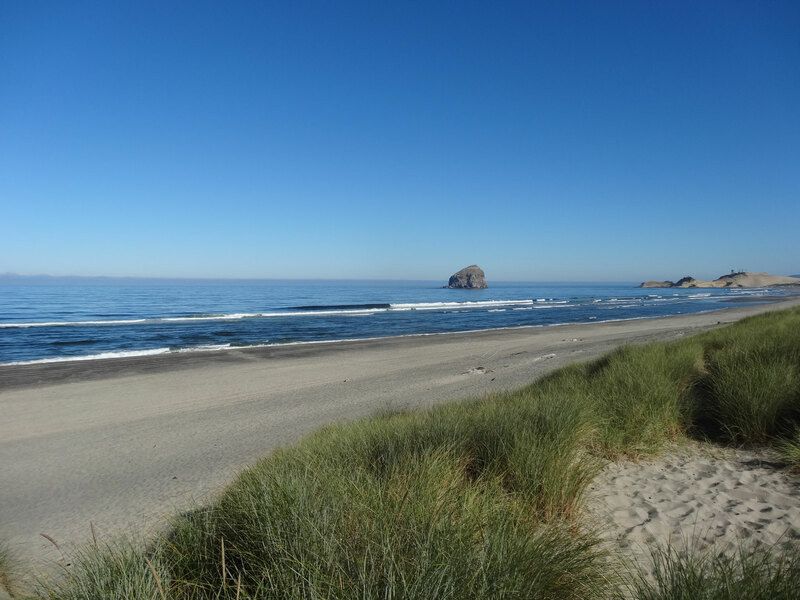 For three days we rented a car and went on a roadtrip to the Oregon coast. 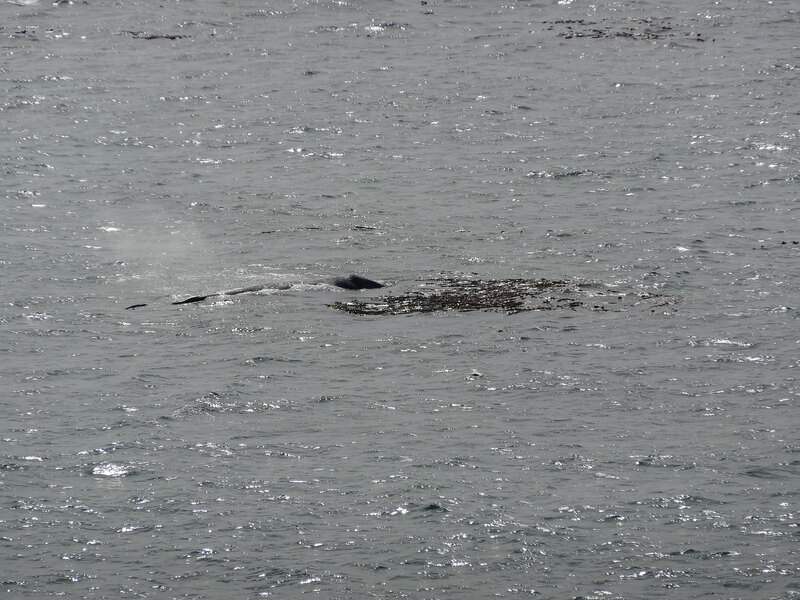 Aside from a lot cooler temperatures on the coast, we saw majestic gray whales a few times and had the best breakfast of the entire trip sitting at a view point and watching at least 4 gray whales in the waters in front of us. It has been one year on the road already, and we're still loving it. Getting on our bikes and embarking on this adventure has been one of the best decisions of our lives. And despite bumpy roads, aching muscles, devilish headwinds or ruthless drivers at times, we still couldn't imagine a better way of seeing this world. Next, we will get back to the mountains again, go through Mt. St. Helen's and Mt. Rainier National Parks before heading to the coast in Seattle. We are already very much looking forward to cycling along the San Juan Islands, taking ferries in between islands again and slowly making our way up north.